We have almost anything in the Harley Davidson Motor Clothes line. From Jackets, chaps, vests, halters, gloves and leather goods, to hats, purses, and novelties. If we don't have it, we can get it for you! We also carry a variety of Harley Davidson T-shirts and sweatshirts as well as our own private line. Just one example of many Tshirts we offer below. 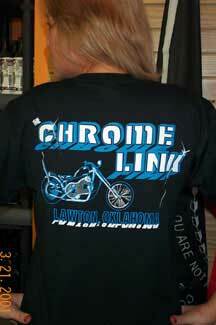 BIG Mike Griffin Livin' Large- Chrome Link Tshirt. Select the size you want and click on the "Add to Cart" icon. When you get to the cart please select USPS Parcel Post for shipping options to allow our cart to properly calculate the $ 5.00 shipping fees. Click here now for more Ordering Information.